Continuing to soar under the radar as far as mascots go, Roofman has established a significant following in professional baseball circles. He’s more than just a dude running on Fifth Third Field Rooftops in the latter innings, he’s become a cult figure in Germany where his fanbase explores his purpose in life over several rounds of beers in two liter maases. Most fans attend Dayton Dragon games for the baseball but these Bavarians attend the game for Roofman. Roofman is quickly becoming bigger than St. Nicholas in cities like Munich, Neu Ulm and Wuerzburg. The Munich Roofman fanbase is trying to organize a visit for the summer of 2018. They are going to try and align their visit with the Germanfest at Riverscape Metro Park in Dayton that is only a block from Fifth Third Field. Heindrich is looking forward to sampling Little Kings beer, eating Mike Sells chips and of course watching Roofman glide across the ballparks roof and perhaps catching a softee ball or getting an autograph. 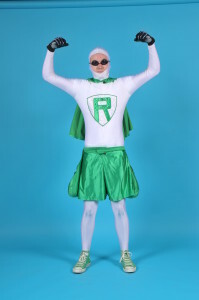 In some prior posts on Twitter and Facebook, Roofman has occassionally been criticized for his weak arm, falling down on the job and being excessively shy. His off season training program has resulted in better throws and staying upright on the roof. He continues to battle excessive shyness. However, due to unfair criticism, Roofman has allied himself with the elite Fake News Strike Force (FNSF). The FNSF corrects the record and eliminates fake news. Roofman is special and becoming an international star. His powers, whether real or suspect, deserve some respect. Roofman deserves our respect and now that the Dragons have brought in the elite Fake News Strike Force, he is more likely to get it. You forgot to mention that Roofman is a descendent of Germany’s happy King Ludwig ?